All our cake recipes are listed below on one convenient page. We have personally made each recipe twice and all the pictures and videos are our own. Click on any description below to be taken to your chosen recipe. 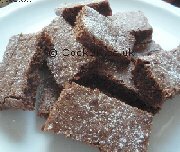 Simplicity itself to make this chocolate fudge recipe requires no complicated equipment and produces top quality results every time. We use flour in the recipe to produce a slice of delight at less than 120 calories per serving. Bake this family favourite cake to perfection with our recipe, step by step instructions, pictures and video. A classic cake which is so easy to bake. Light sponge drenched in a lemon drizzle makes this both sweet and sour as well as moist and light. Keeps very well. Very easy to make, these crumbly cheese biscuits have the lightest texture ever. Top them with sweet peppers, smoked salmon or cream cheese to make a colourful and unique selection of tapas dishes. Our secret favourite topping though is marmalade! 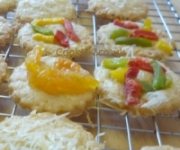 The sweet and sour taste is perfect with these savoury biscuits. Very simple to bake but very tasty at the same time. A great way to use up an excess of summer fruit. Step by step instructions and pictures show you how to make the lightest carrot cake ever. 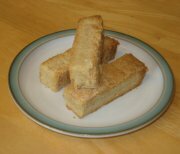 A very quick and simple recipe for perfect shortbread biscuits. If you believe that you can't bake then this is one recipe which will prove you wrong. Simply follow our step by step recipe with helpful pictures for the perfect shortbread biscuits. Promise! The latest fashion in home-baking is the cupcake. We show you how to make the perfect cupcake base and then provide you with lots of ideas for decorating them. Go on, be creative with these tasty treats. 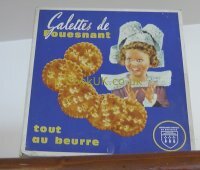 Most commonly found in Brittany and Normandy these French cakes have a tradition going back centuries. Very tasty and not too complicated to bake. Another of our delicious crumble recipes. This time the crumble topping has chopped almonds in it making it an ideal combination with blackberries and apples. Delicious layers of sponge and apples topped with a crunchy crumble topping. 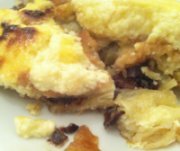 This a traditional German Apple Cake which is delicious eaten warm or cold. Our pictures and videos take you through the cooking process step by step. Rich and chocolatey this is a different and very tasty way to cook an old favourite. This recipe shows you how to make the perfect apple crumble. The tastiest crumbliest topping with apples cooked to perfection. This is a savoury version of the traditional galette. Ham, Gruyere cheese, eggs and herbs combine to produce the ultimate summer time food. It can be eaten hot or cold and makes a great breakfast from the fridge. This is a moderately complicated dish but our pictures, video and step by step instructions will guide you thorough. A sweet version of the traditional galette. The puff pastry is filled with apricot jam and the classic frangipane paste. Another French classic, this galette can also be eaten both warm or cold. Link to our Galette index page is here. In between a cake and a bread, Banana Bread is supremely tasty. The sliced cake shows how perfect this recipe is. A delicious crumble using summer plums topped with an oaty and crunchy crumple. The key to a truly tasty banana cake is to make the inside as moist as possible with a firm skin. Easier said than done but our step by step instructions and pictures show you how. The British version of a cheesecake. 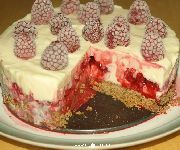 The tang of the raspberries perfectly compliments the sweetness of the cheesecake. And if you eat with your eyes then this cake is a delight to behold. 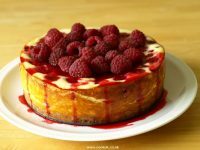 We have made this recipe four times to get it step perfect so that you can make the perfect cheesecake. With twenty step by step picture we show you how to bake the best apple pie ever. Crumbly pastry and firm fruity apples are yours in this recipe. Another quick recipe, prepare and cook these scones in just under half an hour. They taste good warm or cold and freeze perfectly. This is one of our simplest recipes with only four ingredients! Simple to make it may be but at the same time this is an exceptionally tasty crumble. The biscuit for the chocoholic amongst us these are the most chocolatey brownie biscuits ever, so very tasty they will have everyone coming back for more. Deliciously light and deliciously chocolate! 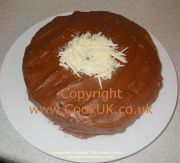 Our step by step instructions and pictures take you through exactly how to make the best chocolate cake ever. This recipe takes only 25 minutes from start to end. The result is a batch of fresh cookies which make a delicious treat for adults and kids. Designed for Christmas, but great at any time of the year. Perfect as a birthday cake with candles on it. A delicious crumble recipe especially when fresh raspberries are in season. Bring a taste of true Cornwall into your kitchen with these tasty scones. Serve them butter, jam and clotted cream for the perfect cream tea. 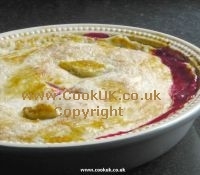 Gooseberries have a tart taste which makes them ideal for a crumble. Easy to make and tasty to eat. It's the pastry that makes these taste so much better then shop bought mince pies. A great treat at Christmas but just as good at any time of the year. The mixture takes about 10 minutes to prepare and each pancake takes about a minute to cook. What could be quicker than that. Top them with jam, lemon and sugar or honey for the perfect pancake. 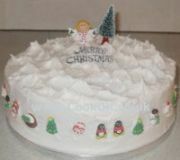 Our recipe covers everything you need to make a delicious Christmas cake. From baking the cake to icing it and decorating it. All with step by step instructions and pictures. 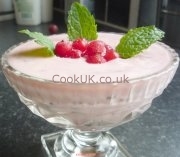 The simplest sweet recipe ever but so tasty and colourful. This is a winner which can be prepared well in advance. Another traditional Christmas snack which should be cooked more often. Our recipe shows you how to bake super sausage rolls the easy way. A taste of summer fruits! 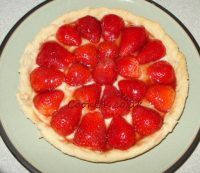 The sweet short crust pastry recipe was supplied by one of our readers. It certainly makes a very tasty flan. Our detailed step by step pictures and instructions show you how to make perfect short crust pastry. We also have a video link from this page. 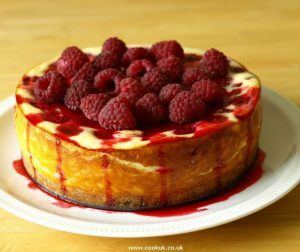 A truly delicious baked cheesecake which can be made with most soft fruits if raspberries are not your favourite. Easy to make, this is a spectacular dish. A delight on a summer's day, Gooseberry Fool has a creamy texture and a sweet and sour flavour. We used red gooseberries from our own garden but shop bought green varieties of gooseberries work just as well. Our gooseberry fool recipe page has lots of ideas for toppings but feel free to use whatever you have to hand. A delicious sweet at any time of the year especially summer. You may think this is just an apple tart but the almond base makes this a truly delicious galette. We use puff pastry, and lots of it for that melt in the mouth feeling. 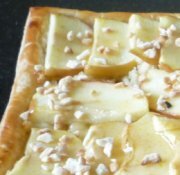 Top that off with a delicious almond paste, sliced apples and chopped nuts for a slice of heaven.